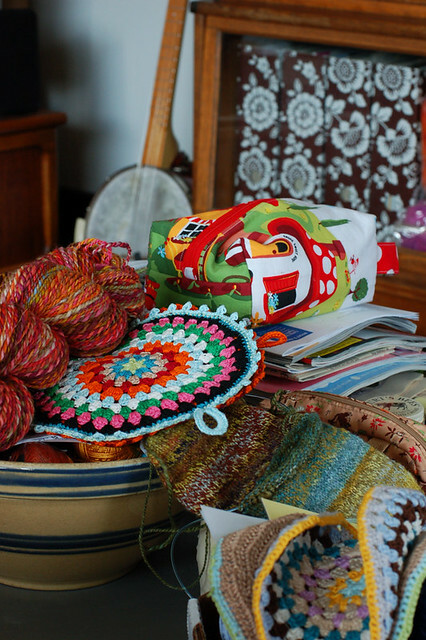 After a one-year hiatus, the potholder swap is back and we couldn’t be more excited! We’ve changed some things around, so be sure to read the rules thoroughly. There’s no need to sign up or notify anyone in any way that you intend to swap. Have your potholders at the destination below by April 1 and you’ll be swapping. If you don’t have them there on time, they’ll be returned to you. Feel free to participate in the Flickr and Ravelry groups, but it’s not a requirement. 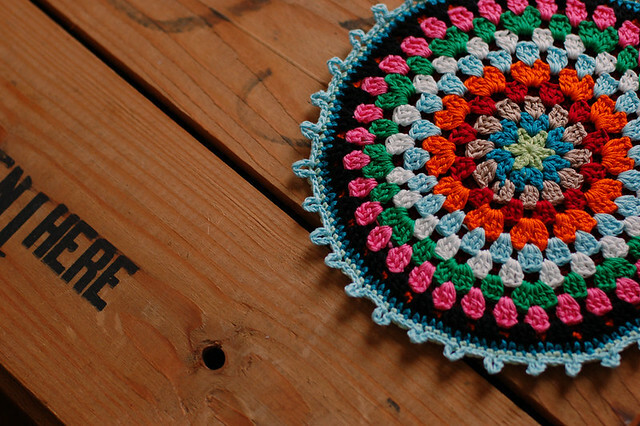 Each participant is required to crochet (and only crochet) 3 potholders in the same pattern. Please do vary the colors as you see fit. We don’t want you bored to tears! Please be sure your hot pads and potholders measure between 6 and 8 inches across and are double thick. THEY MUST BE WITHIN THESE SIZE PARAMETERS OR THEY WILL BE RETURNED TO YOU. To make a double thick potholder, crochet the same pattern twice, or do a fancy side and a plain side, then join at the edge. Please make your potholders at a reasonably tight gauge. We don’t want burned fingers! We’ll be using 100% cotton yarns exclusively. No blends, please. Label each pad/holder with maker and care instructions. Feel free to include yarn and pattern info. Affix the label with a safety pin or tie it on. No straight pins, please. We had a lot of trouble with labels coming off during the first swap. We don’t want to accidentally send you one of your own potholders. These are absolute requirements and if you don’t follow them, you won’t be able to swap. After the potholders are received, your hosts are going to get together and have a grand time looking at all of your gorgeous work and selecting 3 different beauties to send back to you. The goal of this swap is to produce and receive little pieces of crocheted art. Use beautiful yarns, color combinations, and patterns. Don’t feel pressured to use teensy little crochet cotton. Thicker cottons like Tahki Cotton Classic, Rowan Cotton Glace, and Elann Sonata make great potholders. Have a ton of fun. US participants need to include a self-addressed, postage-paid, large First Class Envelope. You will have to provide your own Self-Addressed Stamped (Non-Priority) envelope. The current first class rate for a large envelope weighing up to 13 oz. is $3.38. We will make sure all packages stay under 13 oz. so that we’re sure your postage is covered. You will have to purchase the stamp(s) to cover this. Postal regulations have changed since the last swap, so to be sure you receive your package, we require first class envelopes only. People have trouble every year with a postal employee trying to be helpful and telling them to do something different than what we are saying to do here. PLEASE buy a large envelope (Bubble wrap-lined is good, and so is Tyvek. Those heavy ones filled with paper pulp are bad because they will put you in Priority Mail territory with their weight alone), address it to yourself, put $3.38 worth of stamps on it, and include it with your potholders. DO NOT SEND PRIORITY MAIL TYVEK ENVELOPES. Non-US swappers, the only way for us to collect postage fees from you is PayPal. We expect packages to weigh under 10 oz., so postage should be between $8 and $14, depending on where you live. You must include your email address ON the outside of your package, with your address, so that we may email you for your postage fees. If you don’t, we won’t be able to contact you and send your package back. We’ll create a thread in the Ravelry group for pattern and yarn suggestions. Please add to it! Keep us abreast of your progress, both on Ravelry and in the Flickr group. Talk about yarns, show your in-progress hot pads, and tell us about patterns. This will be a blast! There’s also a really nice group on Flickr for showing off potholders. It’s great for inspiration. Feel free to contact me using the button in the upper right hand corner.